Noticing that your gums bleed when you brush your teeth can be an alarming discovery. The main question you’ll be asking when that happens is why? Why are your gums bleeding when you brush your teeth? There are many reasons why gums bleed, some of which are temporary while others are a cause for concern. 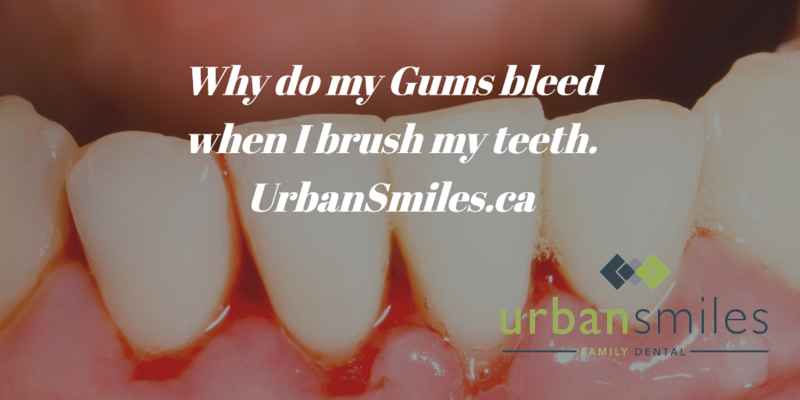 It’s important that you make an appointment with Dr. Andrew & Urban Smiles Family Dental to figure out if any of the following are the causes for gum bleeding. This is usually the first stage of gum disease. It occurs when plaque at the gumline and on your teeth isn’t removed by flossing or brushing infects the gums, leading to the symptoms of gingivitis. Examples of symptoms experienced include swollen gums that become too tender and bleed during brushing. This stage responds well to regular dental checkups and good flossing and/or brushing habits. Not many people know this, but altering your normal flossing routine to a new can lead to bleeding gums. For instance, if you have started flossing more frequently to remove plaque from between your teeth or haven’t remembered to floss in a few days, you may start to notice some bleeding when you brush your teeth. This should clear up within a few days when your new flossing routine regularizes. According to the American Dental Association, some thinning medications are a common cause of bleeding gums. Such medications usually reduce the ability of blood to clot, thus making bleeding easier. It’s important that you let your dentist know everything about any medications you may be on as well as your experience using them. Of course, a change in toothbrush especially from one with soft bristles to one with rough bristles, can lead to bleeding gums. If that’s the case, consider reverting back to a toothbrush with softer bristles. You should also consider talking to your dentist for recommendations on what you should use. It is not uncommon for pregnant women to experience swollen gums and bleeding when brushing their teeth. This condition is clinically referred to as pregnancy gingivitis. This occurs due to hormonal changes during pregnancy that alter the response of the body to bacteria that causes gum disease. The symptoms often clear up after pregnancy, according to the American Dental Association. Regular brushing and flossing as well as dental checkups can help prevent the symptoms from becoming worse.